Hello and Happy Food Revolution Day! Today I am joining in with Jamie Oliver for Food Revolution Day . As a parent and food lover, I am really passionate about the food my children eat and ultimately their health. The reality is that it is far from easy and the daily struggle is real. Kids want to eat what their friends eat and what the shops sell and no matter how many times you explain the damaging effects of sugar, they will still want it come what may. It really is time for change and we as parents have a responsibility to our children to give them the best chance in life by ensuring good health through the right nutrition. Sugary and processed foods are NOT the way forward and it is time for us to act together to stand tall and encourage government and businesses to create healthier foods. It is time for us to have better choices out there and affordable ones too. Take-aways are still stuck in the same cycle and options for healthy food generally seems few and far between. It is time for us to break this cycle that is continually fuelling this perpetuating cycle of disease. So if you haven’t already join the petition, sign up now! 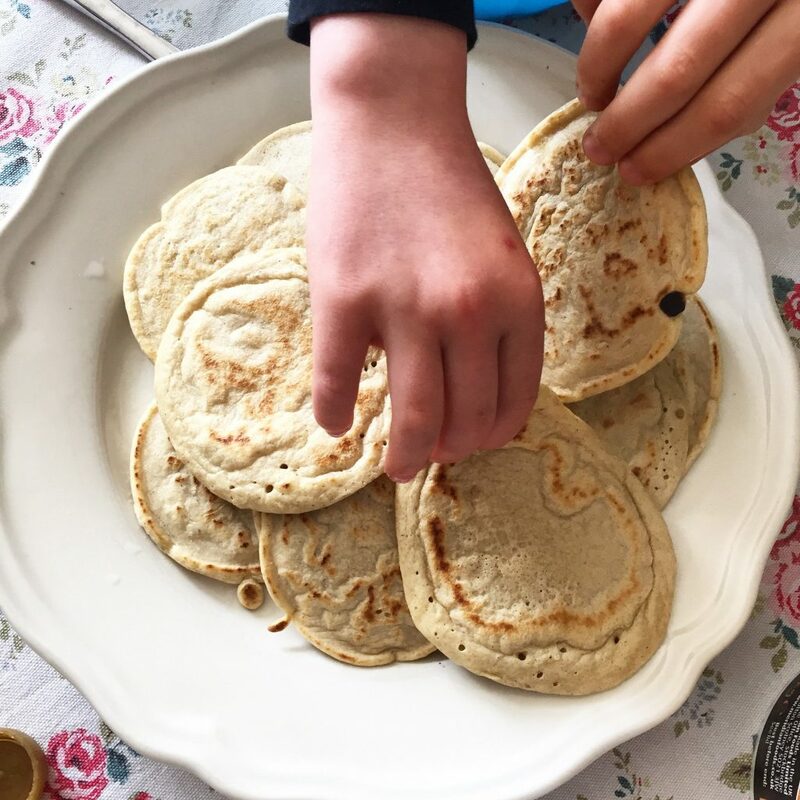 The good news is that healthy food can be super delicious and today’s pancake recipe is definitely a firm favourite in our house and it is not surprising given how darn good they taste! You can enjoy them sweet or as a savoury dish, really the world is your oyster. What I love most about making pancakes is the fact that they bring a really positive energy to the table. All it needs is for one of the kids to smell or see a pancake and some kind of euphoria wafts through the house. 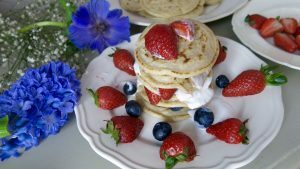 Honestly, I wish all my food could have this effect on my kids (must work harder ;-)!It’s also a great way to introduce cooking with the kids and I find that mine often ask if they can make some pancakes on their own and fortunately this recipe here is so easy and better still foolproof, which means my seven year old can pretty much manage from beginning to end (with a little supervision around the hot stove). I have experimented with many different variations on the theme, but this recipe right here seems to come up trumps every time and when my worst critics, aka the kids, give it the thumbs up, I certainly don’t argue. They are completely free from gluten, dairy, soy and sugar and offer good levels of Vitamin A, D, E and B2 (Riboflavin) as well as Calcium, Magnesium, Manganese, Phosphorus and Zinc. I would urge you to introduce these into your life (for us it’s generally a Sunday affair, and sometimes a sneaky midweek treat). I hope that like the rest of us Huberts, this recipe here will become your go to pancake recipe for all occasions. So here is what to do! 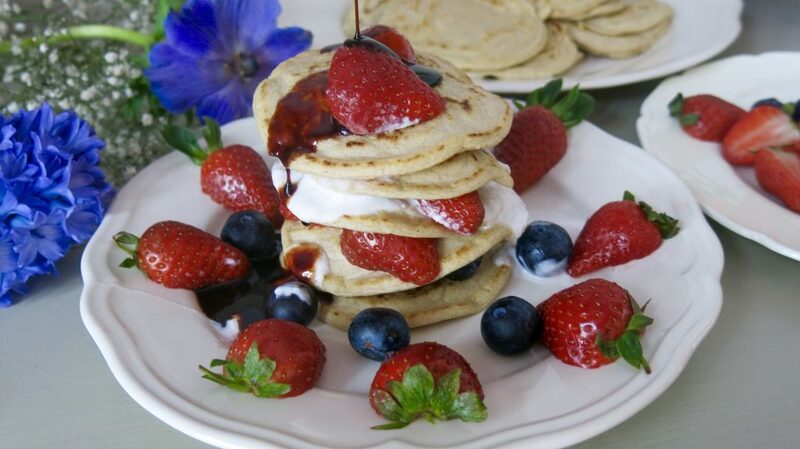 The Best American Style Pancakes you’ve ever eaten! I literally throw everything in my blender (my choice is Vitamix all the way), blend till it’s a smooth consistency. Heat a frying pan on a medium to high heat (no oil needed as the recipe uses coconut oil) and then simply pour equal sized mini pancakes from there. If you don’t want to pour straight from the mixer, I find a tablespoon makes the perfect size. They literally need a minute or so on each side to be done. You can substitute 1 tbsp of flour for 1 tbsp of ground flax seeds. 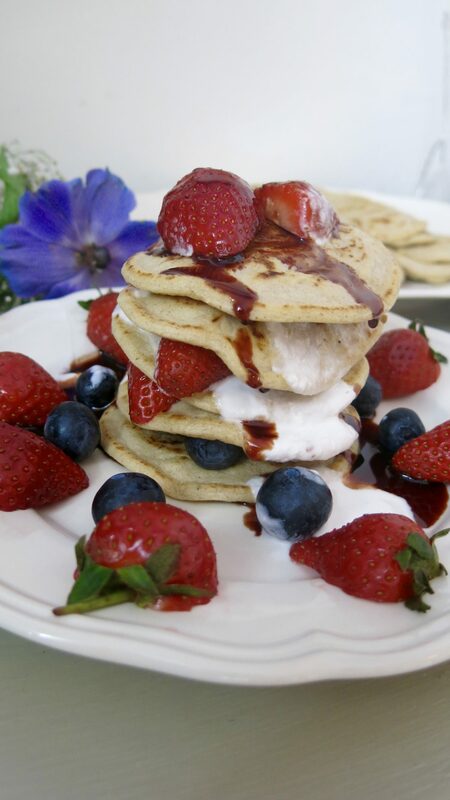 These are best served with coconut yoghurt, a drizzle of Biona Organic Date Syrup and fresh blueberries. This should make around 14-16 pancakes. I would love to see your creations so please share them with me and if you’re on Instagram then just tag me @thewellnessjunction. I would also love to hear your feedback, so don’t be shy to comment below. If you haven’t already subscribed to my mailing list (top right hand corner of my blog) then please do so to ensure you get notified when I post my next post.